Pints for Paws - Forget Me Not ASLV's 3rd Birthday Bash! Join us on Saturday April 20th, 2019 for our second Pints for Paws event in partnership with Tenaya Creek, a local brewery brewing up great brews! We have collaborated together to create a fun afternoon of animals, beer (or craft soda), fun and food for the community. We want everyone to come together for a great afternoon on the patio while contributing to doing good in the neighborhood for animals that need our help. Not only will we be getting together to fundraise but we will also be celebrating our 3rd Birthday Party! We will have two batches of tickets available for purcahse - Pre-Sale and General Admission tickets. Pre-sale tickets will be sold for $20 and General Admission tickets will be sold for $25 both in advanced and/or at the door if the event isn't sold out. This ticket link is for Pre-Sale Tickets only! Each ticket will include a limited edition event pint glass, a FMNASLV sticker set, a complimentary pour of select Tenaya Creek draft beers or craft sodas and a raffle ticket for entry to win one of the many raffle prizes we will have. With your first pour free, there will be $3 refills on select Tenaya Draft beers or craft sodas for remainder of event! We are releasing pre-sale tickets only right now so get your tickets ASAP! We will have food provided by Ruse Vegan Kitchen! We will announce the full menu as soon as we can! Ruse Vegan Kitchen will be donatined 15% of total sales that day back to the rescue! We will have our available animals who are looking for their forever homes with us all day. All of our adoption fees will be sponsored by Zappos with approved adoption applications and home checks. Come out and meet all of our pets during the event if you are interested in adding a new member to your family! We will also be networking for new foster care parents and volunteers so connect with us at the event if you are interested in helping out. All of our merchandise will be available for you to purchase including t-shirts and tank tops, stickers and pins and our adorable tote bags! Any leftover pint glasses will be sold after ticket sales close. Raffles ticket prices and prizes will be announced closer to the event. In addition to meeting our amazing animals and guzzling some tasty beer we will have board games, corn hole and darts ready for you to challenge each other with all afternoon. 100% of the proceeds from the tickets, raffles, merchandise sales and any donations received at the event will go directly towards Forget Me Not Animal Sanctuary of Las Vegas and our rescue animals. This event is 21+. All dogs well-behaved and leashed dogs are welcome! We are so excited and absolutely can't wait to see everyone there! Our goal for this adoption event is to find all of our adoptable animals a forever home! Come spend the afternoon with us on December 16th from 12PM-4PM for our winter adoption event! We will be spending the day with one of our favorite community partners - The Fergusons Motel. You will have an opportunity to meet all of our available rescue animals who are looking to meet their forever homes. We will also have our merchandise there for you to pick up including stickers, pins and t-shirts! We have a great stock of our environmentally friendly carrying totes as well! ALL ADOPTION FEES WILL BE SPONSORED BY ZAPPOS! So what happens if you meet a critter you love want to take home forever, you ask? Well, once you meet your new best friend you will fill out an adoption application on our website, we will schedule and home check and if all goes well with the home check then you will start an adoption trial! SO EXCITING! Can't make it to the event? There are plenty of other options to show your support! You can make a tax-deductible donation at our website - forgetmenotaslv.org, via PayPal - forgetmenotaslv@icloud.com, or by purchasing an item on our Amazon Wish List to donate - http://a.co/eag7fFa. We can't wait to see you at this event! Join us for a day of unique and awesome garage sale finds to help us raise some funds for our rescue. We will be hosting this event on March 16th from 11AM-4PM. This event will be held at @rebarvegas on their patio. We are collecting some awesome donations - clothes, small antiques, vintage finds, home goods and furniture - for you to come shop through to help us raise money for our rescue animals and operational costs! We will have hand made, recycled, tote bags made from t-shirts that you will be able to use to shop! We will be asking for $20 donations for a t-tote (repurposed t-shirt tote bag) and shopping entry! When you purchase a t-tote you will be eligible to shop the entire garage sale and fill up your tote bag with AS MUCH AS YOU POSSIBLY CAN! Needless to say, furniture and any larger items will be price marked accordingly (because there's no way a blender or a chair will fit in your t-tote!). The patio space is 21+ only. Interested in donating some items to the Rescue Rummage Sale? You can also swing by 9am the day of the event to drop off your items - but please give us a heads up! Drop off will be at the entrance of the back patio - we will have a table set up so you can't miss us! Contact us by email - forgetmenotaslv@icloud.com or message on privately on our FaceBook page to coordinate dropping off your items to us! Adoptions & Donations on the Patio! Forget Me Not Animal Sanctuary of Las Vegas and Aware Coffee Tea & Lounge are partnering up next month for an adoption event! Come see us on March 2nd from 11AM-2PM, meet our adoptable animals and enjoy some delicious coffee or tea on the patio with us! When you bring an item to donate we will stamp your hand to qualify you for the BOGO promotion. Adoption fees will be sponsored by Zappos with approved adoption applications and home checks. We are partnering with Island Pet Hospital for a super awesome event during National Chip Your Pet Month! On Sunday May 6th, 2018 from 10:00AM-1:00PM we will be hosting a low-cost clinic for the community where we will provide low-cost pet services, including microchips. The clinic is located at 7025 W Ann Road. Microchips will cost an affordable $15 per microchip and come with free registration and free lifetime use. You can't beat that! Every dollar of our micrhcipping proceeds will go directly towards our account with Island Pet Hospital to contribute to medical costs our rescue animals accrue. Microchips will be first come first served - we will not be doing sign ups for this event like we have done previously. We are working on integrating low-cost vaccines for those pets who need to become current on all of their vaccines as well. Vaccine information TBA - stay tuned! This event will not only include low-cost services for your pet but we will also have a booth set up with our merchandise! Our friends at Bleu Moon Bakery will have a pop-up booth with their infamous Forget Me Not Puppy Treats that will be for sale for $6! Your puppy will LOVE them! We hope to help the community keep many pets safe. We hope to see you at our event - and remember, it's a walk-in clinic and will be first come first served. We will not be taking appointments. Join us for an exciting and fun-filled day at Sunset Park with Mix 94.1 for Pet-A-Palooza! We will have an adoption booth where you can come say hi to us, meet our adoptable animals and pick up some of our really awesome merchandise! This is the perfect event to potentially meet a new forever family member! We will not only be raising awareness around our rescue organization and our animals looking for their forever homes, but also educating the community on the importance of microchipping and pet safety laws. Bring your family and enjoy this pet-friendly event all day long with us! The event includes local pet stores, boutiques, trainers, groomers, veterinarians, entertainment, food, and so much more! We can't wait! Join us at Pinot's Palette in their Boca Park location where we will be drinking, painting, and raising funds for our rescue! Drinks can be purchased throughout the event and snacks will be provided. We will have a silent raffle for some really great prizes as well! Bring your friends, your family, and any other animal lover that you know! You will be painting an adorable design that could also double as the perfect Mother's Day gift! Tickets can be purchased for $39 here. Nevada's Big Give - 2018! We are a registered 501(c)(3) organization that will be participating in this year's Nevada Big Give! What is Nevada's Big Give, you ask? Nevada's Big Give is a 24-hour online crowdfunding event created to rally community support for Nevada's charitable causes. On March 22, 2018, thousands on Nevadans will come together to support nonprofit organizations and qualified schools (i.e. schools with 501(c)(3) status or an affiliated 501(c)(3) foundation such as the Public Education Foundation, that can accept charitable donations on their behalf) across Nevada and make a real impact - every donation gives organizations the chance to win financial prizes while also furthering their mission. Adoption Event - Fergusons Motel Market in the Alley! Come spend the afternoon with us! We will be spending the day with one of our favorite community partners - Fergusons Motel! You will have an opportunity to meet all of our available rescue animals who are looking to meet their forever homes. We will also have our merchandise there for you to pick up including stickers, pins, and t-shirts! You can also contribute to our property funds by making a tax-deductible donation in person! Come show your favorite local animal rescue organization some love on St. Patricks weekend! Forget Me Not ASLV will be having an adoption booth at the new and amazing First Friday South for the first time this upcoming First Friday! Curated by the owner of ReBAR, First Friday South is just another outlet for the local arts and small businesses to gather together to enjoy music, art and old fashion community feels. We will have some space to display our merchandise as well as have plenty of our available rescue animals ready for meet and greets with every single one of you! We will be featuring Bleu Moon Bakery, a small local plant-based bakery, who will be donating a delicious gift bakset full of baked goods! Tickets for the raflle will be $5 for one or $20 for five! Bleu Moon Bakery will also have samples of the raffle basket treats available to taste test beforehand! Come say hi to our rescue animals, enjoy some amazing delish vegan baked goods and support your local animal rescue! Check out Bleu Moon Bakery and FFS when you have time! Join us for a night of laughter and fun at one of our favorite hangout spots in the Arts District! 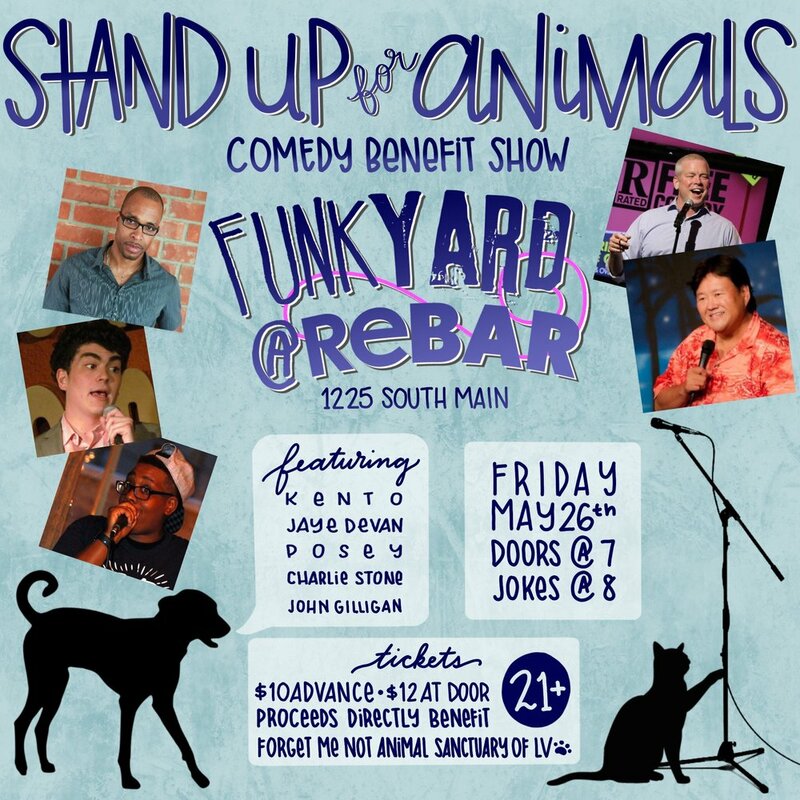 John Gilligan, Charlie Stone, Jaye Devan, Posey, and Kento take over the FUNKYARD stage at ReBAR! There will be plenty of laughs, a full bar, antiques, good company and vegan (and non-vegan) sausages to enjoy! If you've been to one of our Stand Up for Animal events before, you know just how much fun they are. If you haven't yet, now is your chance to support not only us but also some amazing local comedic talent at the only bar in town where “Everything's For Sale!” (Seriously, ReBAR is awesome. It’s part bar, part antique store). Don't miss out! Doors open at 7PM and the jokes start at 8PM. $10 for tickets in advance, $12 at the door. All proceeds go directly towards helping local animals in need by funding our rescue care and operational costs. *Comedians and event details are subject to change. The very anticpated GREENFest is finally here! And Forget Me Not ASLV will be there with an adoption booth set up from 9AM-5PM! We will have a few of our rescue animals with us to meet and greet potential familes and just to say hi and hang out! We will also be accepting donations of both supplies and shoes to support our Funds2Orgs Shoe Drive Fundraiser - so if you've recently thought about donating to our organization or clearing out your closet, now's your chance! This is going to be an amazing day for a great cause with tons to do for the entire family. You don't want to miss it! Click here to read more about GREENFest and to get tickets (click the photo to view the Facebook event). We are so excited to be apart of GREENFest this year! Can't wait to see everyone there! Come say hi and support us during Downtown Wellness Council's Wellness Village event at First Friday in the Arts District on April 14th! The event starts at 5PM and will run until 11PM - our table will be open the entire time! We will not only have a few dogs and rabbits that are all available for adoption but we will also have a donation drop off bin for any shoes that you would like to donated for our Funds2Orgs Shoe Drive Fundraiser we are having for the next few months! Spend your Friday night enjoying local music, food, arts, and animals! What can be better than that? Pop-Up Fundraiser! Are You Feline What We're Feline? Come join us for another Happy Hour Pop-Up fundraiser on February 20th. Not only do you get to pig out on delicious vegan food but you'll also receive a free pop-up drink with your dinner! There will be a live DJ for your listening pleasure! 20% of the proceeds between 4pm-6pm will be donated to FMNASLV to support our rescue animal care and medical costs! We are so excited to announce our second Stand Up for Animals Comedy Fundraiser. It is going to be held at the local Majestic Repertory Theatre, which is located in the Arts District on S Main St. There will be a $10 donation cover when you reserve your seat early, and $13 donation cover day-of, at the door. Proceeds benefit our current and future rescue animal care costs, including medical costs and supplies. A portion of the proceeds also benefit Majestic Repertory Theater, another non-profit that promotes the arts in our community! We have a 60 seat maximum and are alotting for 50 pre-sale tickets with some room for day-of door entries. Doors will open at 7:30pm and the jokes will start promptly at 8:00pm. We can't wait to see you then! Lowered dog adoption fees for the holidays! Contact us today! Our first friendsgiving! VegeNation has so kindly paired with us for this pop-up fundraiser. 20% of your total bill will be donated towards Forget Me Not ASLV. The event will be during Happy Hour and we will have a special fall entree and cocktail added to the menu for this event! We are expecting a really good crowd so we are separating the event into two time slots; 4PM-5PM and 5PM-6PM. There are 30 tickets available for each time slot. We can open the event up for more if we fill up the current seats! FMNASLV will have a booth at this year's Grow Your Own Festival! We will have a few of our animals that are ready and available for adoption. Come hang with us and the pups! We will have some merchandise for sale, as well. We are extremely excited to be a part of something so awesome and something so engaging for our community. We're excited to announce the launch of our B-Cause Pets Booster Campaign with CustomInk! This campaign is live until the end of the month and we do have to sell a minimum of 17 shirts in order for them to go into production and shipped directly to you guys but have a hefty goal of 50 so spread the word! Not only will you get this super cute shirt but every purchase benefits our organization and the animals in our care! We are coming together to celebrate PAWsitive Difference Pet Rescue's one year anniversary! We'll have adoptable pups, face-painting, DJs, food trucks, and more! Join the fun and hang out with us at the beautiful Painted Desert Golf Club! A night of ridiculous comedy and drinks at the Velveteen Rabbit downtown! This event is 21+, $10 cover at the door - all proceeds go to FMNASLV to help us continue giving the best care to all our animals. Help save animals by hanging out at a water park while listening to local musical talent? Who wouldn't want to do that?! Our second benefit show will be at Wet'n'Wild in the heart of summer when the temps are perfect for swimming. The music artists that are supporting us by playing this show will be performing from 12:00pm to 5:00pm but feel free to hang out anytime during the park's hours (10:30am-8:00pm). Tickets are $25; proceeds from each ticket will be donated to Forget Me Not Animal Sanctuary of Las Vegas. These are General Admission tickets but at a much lower cost than if you purchased from their site or paid at the gate! Just a few changes! Wet'n'Wild tickets are still good as all day passes at the park and we still get a portion of the proceeds. However, the music will be moved to a different venue. If you purchase a ticket to Wet'n'Wild, your ticket stub or proof of purchase will allow you entry to the venue to enjoy some sweet jams. If you only want to attend the music show, it will be $10 at the door. Venue TBA - we'll update shortly after confirmations have been made. Come out and support us and local musicians! Hosted at the bewitching Velveteen Rabbit downtown, it's only a $10 donation cover to enjoy these bands and hang out with us. 100% of the proceeds will go directly to the start up of Forget Me Not Animal Sanctuary of Las Vegas. Below are all the great local talents that will be performing. A ginormous thank you to all the bands who have volunteered to do this show - it warms our hearts to see so many animal lovers get together to make something great happen!! Hope to see you all there!